You first studied Art History, what initially led you to ceramics? I had always been interested in ceramics, I tend to think this comes from the handmade pottery we had at home when I was growing up. I liked using these pots and the way that they each had a very individual character. In college, I was interested in studying many things and finally settled on Art History during a year abroad in France. I also took many studio arts classes, including ceramics. I thought Art History would give me a foundational knowledge about art that would lead more directly to a career. But when I graduated, I realized that either direction, art history or studio art, would take a great deal more study and dedication. I decided that I would rather work in a studio making ceramics than continue with art historical research. I had learned about the mingei folk art movement in Japan that valued handcrafted utilitarian objects. These were the aspects of ceramics that initially most appealed to me and so I went to Japan to study pottery. 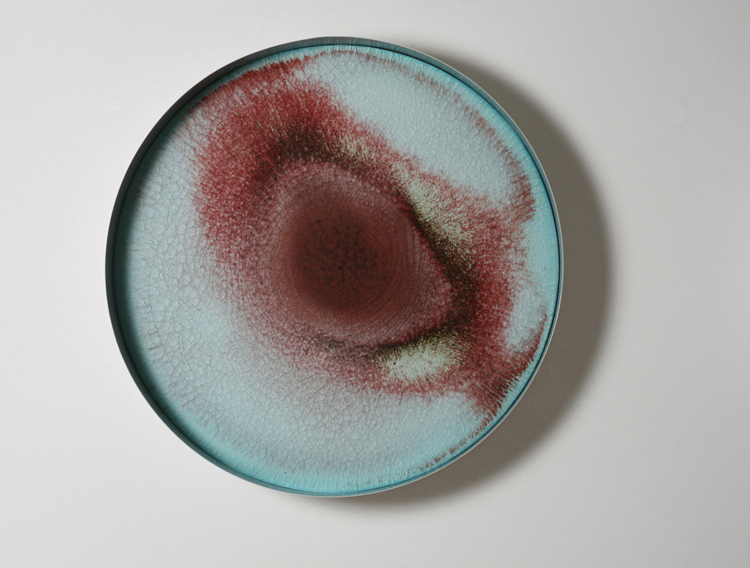 What inspired you to pursue ceramics after your initial introduction? At first, I just wanted to become more skilled and this I was able to do in Japan. Then I came back to Los Angeles wanting to become a production potter. For this, I needed to learn more about glazes and firing, so I started taking some classes at Cal State Long Beach. There I began to find out just how much there was to discover in ceramics: glaze material combinations were endless, clay did much more that I knew that it could, and artists were doing incredible things with it. The more I experimented the more I found there was to try. I became fascinated by all of these materials and processes and by discovering what could be done with them. You write that you began in ceramics making pottery, do you recall the experience that was the beginning of your current ceramic work? I took a casting and mold-making course and, having never worked with casting slip, I became really interested in the way that the liquid clay solidified. One day, I happened to mix up a slip incorrectly, and it was much too thick to cast. I tried working with it anyway, and I became mesmerized by how slowly it moved. It seemed that watching the slip slowly flow and puddle affected my own sense of time. I wanted to try to make a piece that fostered a similar experience, so I poured this thick slip over a large standing piece of glass outdoors. As it flowed down and pooled at the bottom the slip formed a base that supported the upright panel. 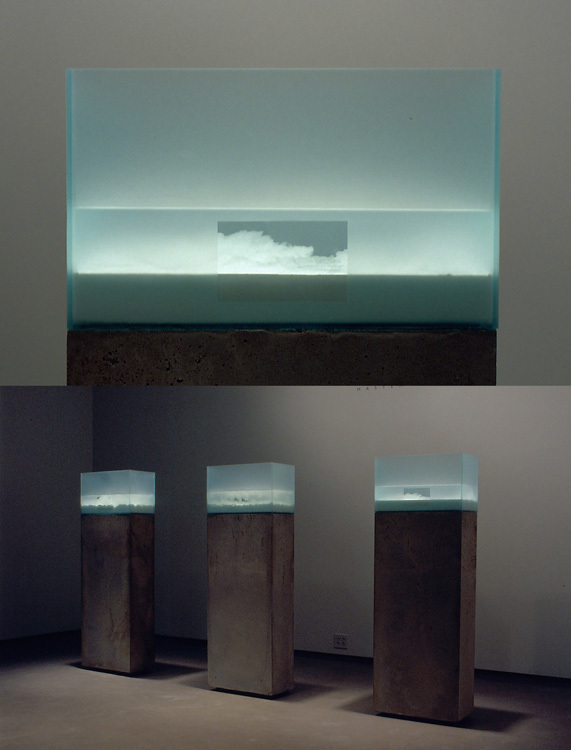 I called the piece “Flows” to contrast the movement of the slip with the imperceptible movement of the glass. Installed outdoors, the temporality of the clay was put in relation to that of the landscape and weather as well. This simple piece explored ways that we perceive material over time and this seems to be at the heart of the way I am still working. You spoke at NCECA of the impact of a research trip to Iceland. Was what you experienced different than what initially inspired the trip? I had been working for several years exclusively with white porcelain and I wanted to think about bringing color into my work. I received a research fellowship to Iceland to go see colorful geothermal phenomena such as boiling blue mudpots and volcanic vents that spewed yellow sulphur. I found the colors in the landscape quite striking. But what I hadn’t expected about Iceland was how clearly I was able to see the interactions of earth and water that comprise the landscape. Most of Iceland is uninhabited and in many places the land lies bare with relatively little vegetation. In addition to volcanic forces, the earth was dynamically animated and shaped by water in all its forms, in glaciers, waterfalls, geysers, springs and pools. It was these interactions in the landscape that I found to be the most profoundly beautiful and moving. How did the trip influence your work? The trip radically changed the way I worked and ultimately the way that I have come to think about ceramics. I went to find color in the landscape and came back wanting to work with water. 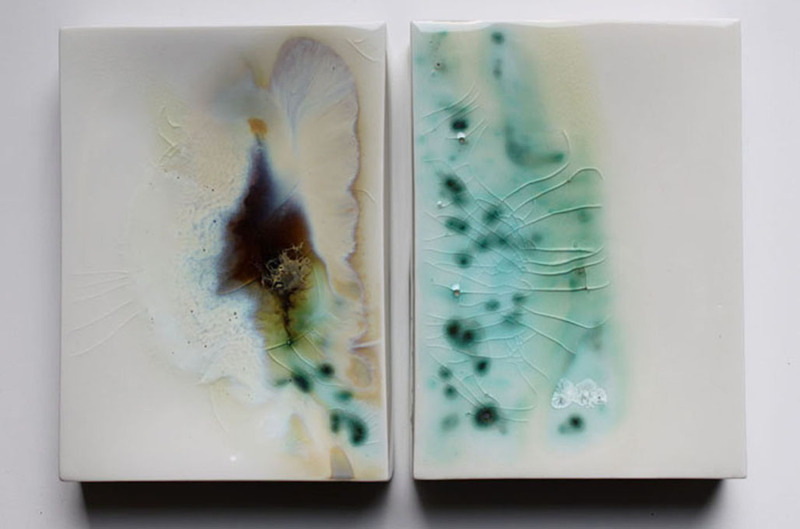 When I returned, I experimented a lot with water and all the materials in the studio. I realized that we couldn’t really do ceramics without water, and that it was essential to all ceramic processes from forming to glazing, and in fact to clay itself. Typically in ceramics we try to remove water by drying and firing. Its final removal renders ceramic objects permanent. As I started to add water back in to raw clay and glaze materials, I saw them undergo various changes in form and character and I became less interested in a final lasting form than in the processes of formation and dissolution. Are there other landscapes you are interested in experiencing as a catalyst for your work? I think that my experience of the landscape in Iceland inspired me to pay more attention to the world that’s around me everyday. In the past several years, I’ve had the chance to live in Western New York, Kansas and Montreal, and each of these places have prompted me to make certain work. In Kansas, I was really surprised to find dramatic shifts in the color of the low rolling plains over the course of the year. When I arrived in the Fall the grass on the plains was a golden amber, and soon they were coated white in snow and ice. In early spring they were charred black by burning, and then burst into bright green with shoots of new grass that soon turned back to yellow under the baking sun. Thinking back on this transformation in the landscape due to a few simple elements changing in multiple ways, I began working on a series of installation pieces that explored the gradual transformation of clays and salts with water under different conditions. In terms of new landscapes to visit, I’m really open to all sorts of places, they all have their unique characteristics. But since I’ve been away from the desert Southwest for a while now, I would love to spend some time back there. I passed through the salt flats in Utah on my way to the East Coast and I’ve been wanting to return to spend some time there and perhaps work on site. 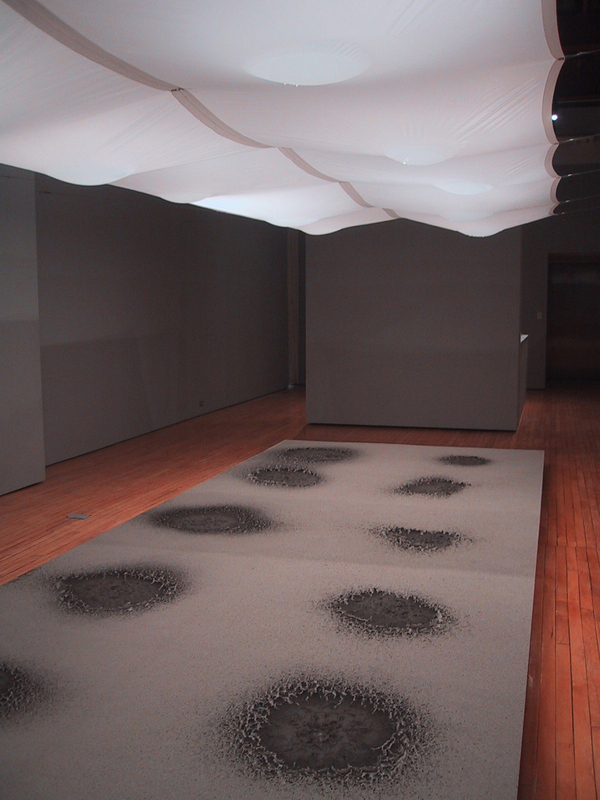 Much of your installation work explores transformation and the effect of time on materials. The results are often textured and tactile yet are only experienced by viewers visually. How do you think this relates to how we experience the natural world? What I hope this work does is to help enrich our experience and perception of the natural world. It’s not an imitation of an experience of nature but brings to our attention aspects of the world that happen around us all the time and are not necessarily at the forefront of our consciousness. I tend to set up the work at a scale that we can relate to with our body and while the viewer is not touching work, I believe that in a sense one can feel it through seeing it. In the same way we can get a feel for a piece of pottery without actually holding it, especially if we’ve had experience working in clay. I think this is how we normally take in the landscape, and many other aspects of nature, from our experience of being in the world with all of our senses. How do you choose the materials you work with? Is there a lot of testing and trials that occur before you find transformations you want to investigate further? I am now fairly familiar with the family of ceramic materials and their tendencies from the experience of working with them. So I make initial choices based on what I think a material will do or what I need it to do. Just like in making a glaze, I then make a series of tests involving lots of trial and error with small batches of material. I see how materials act in different circumstances and over time, and look out for changes that are unusual or intriguing. I then try to figure out how to give these effects or behaviors a presence and duration, and how they might make sense as an experience in the context of a work. This involves another round of trying things out, to find how fast or slow things should happen, how big or small to make them, how light or dark, how high or low, etc. Prior to an exhibition a lot of rehearsing takes place so to speak, like in the performing arts. The caveat is that I am often doing this at a smaller scale than the final work, so I am not really planning everything out completely in advance, but rather getting a good sense of how things will behave and what will happen. The final installation on site is really where everything comes together for the first time, and where the final decisions are made. In this sense the work is always new to me, and the process stays fresh and alive. How do you think your site-specific work influences the perception of the sites? Overall, I hope that the site work gives us the opportunity to pause and become more fully aware of places and what they mean to us. It is often the case that the interpretation of sites happens through the presentation of information such as the historical facts about a particular place. But this does not necessarily help us to experience the nature and relevance of a site. 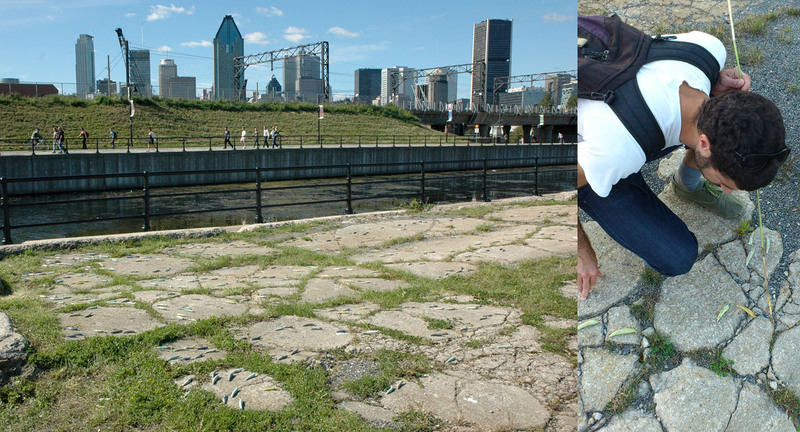 For INFESTATION at the Lachine Canal National Historic Site in Montreal, I laid out 1000 crystalline-glazed ceramic slugs as if they had spontaneously generated out of the former industrial waterway. I wanted to tap into the idea that decay is a precursor for renewal in the city by using the metaphor of the city as a garden. Through this fiction, as a kind of storytelling, there is a reengagement with the site that lets us experience and understand it in a new way. How does your site-specific work evolve? Does the site inspire the idea or do you choose a place to explore a specific idea? Working with a site is a relatively new way of working for me and came about from moving to Montreal, spending time walking through the city and becoming interested in public art. It’s the element of surprise that jars us out of our regular way of looking at things that interests me in locating work outside of conventional art spaces. I like the idea of taking an ordinary, overlooked or even undesirable site and figuring out a way that a work might enable us rediscover the place itself. So the location generally comes first and then an idea for the work comes in response. As I become acquainted with a place there is a back and forth between ideas and site that develop in relation to each other. Many things happen intentionally, but of course what is really exciting for me is seeing what happens once the work goes live. The project “Pommes de la terre” took place at an apple orchard in the Quebec countryside. I press-molded three hundred apples out of local clay and fired them in circular pits dug between the trees, wanting to play with the mystery of how apples were in fact drawn out of the soil of the earth. The day of the event turned out to be cold and rainy and the pit fires drew visitors like a magnet. As people lingered to warm themselves, watch the firings and finally harvest the cooling apples, the social interaction that developed around the work and the shared sense of place and time that followed from it was as wonderful as it was completely unexpected. 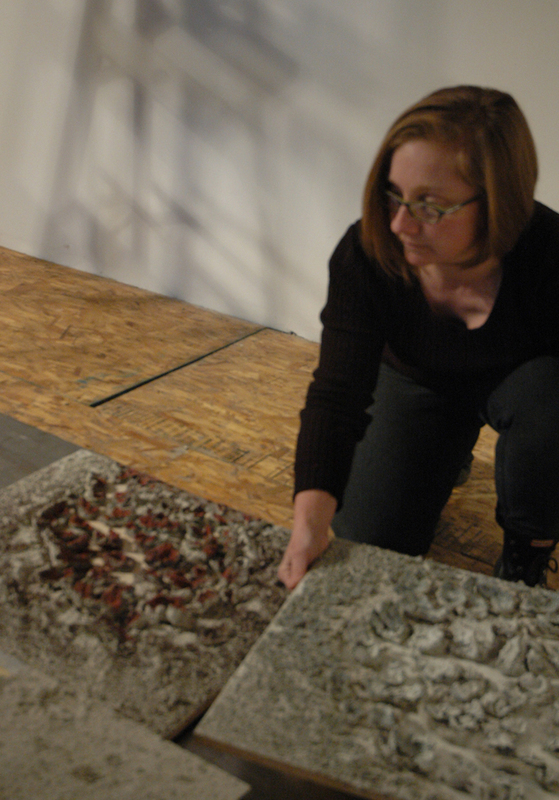 You have a diverse body of work-fired, unfired, installation and site specific as well as a teaching position at Concordia University. How do you balance your studio practice, teaching responsibilities and life’s other practical demands? I’m lucky to live downtown where I teach and also have a studio. Having a short commute saves a good deal of time. Overall, there are times when life is very busy and others when it’s slower and over the course of the year these seem to balance out, although sometimes it can be a challenge. I love teaching and working with students, and when I get deep into a project I can always find the energy for it. Has teaching influenced your studio practice? Teaching has allowed me to explore some ideas that I’ve been interested in even before they have come into my work. As I mentioned, when I moved to Montreal I became really interested in the potential of ceramics in public art, but I was not eligible to apply for publicly-funded projects in Canada as a temporary resident. So I took the ideas that I had about ceramics in the public realm and developed a course at Concordia called Urban Clay. In this course each student creates a temporary ceramic art intervention in a public space around the downtown Concordia campus after submitting a proposal for review by the health and safety officers of the school. In teaching this course I learned quite a bit about what happens with small-scale ceramic objects in public and this experience in a sense has helped prepare me to begin making this kind of work. After teaching this course for two years, an opportunity arose to make the “Infestation” project as part of the Urban Occupations Urbaines initiative in conjunction with Parcs Canada. I hope that more opportunities will arise for me to work with public spaces. Overall, teaching keeps me very enthusiastic about new possibilities with ceramics and I am grateful to my students for this. Has the honour of being recognized as a NCECA 2013 emerging artist impacted the direction of your work? The recognition has been very important personally because the positive reception to the work at the NCECA conference has been so encouraging. I’ve subsequently had several invitations to make new installation work. This aspect of my practice is the most difficult to sustain because it requires a space that can handle the process and is both time and material intensive. This honor is giving me the chance to better develop this area of my work. Do you have any upcoming installations or site specific work? I was invited to create an installation for “FLOW” at the Milwaukee Art Museum for NCECA 2014. The space is quite astounding architecturally, so that the work feels almost like a cross between site and installation work. It’s a really thrilling opportunity to work with such a distinctive interior space. I am represented by the Lacoste Gallery in Concord, Massachusetts and will be in a show there in August. Also this summer, I’ll be in the Workhouse Clay National in Lorton, Virginia from July 31- September 8.